Wanna know one of Inglewood's finest icons dating back to the 1950's? It's a GIANT DONUT. WHAT: Giant donut, LA icon, cultural symbol, famous landmark, photo op, hidden gem, and can we say giant donut again? Randy's Donuts is one of the biggest LA icons there is, and you would never even think of it when you first think of LA, right? The thing is that it isn't necessarily famous for its donuts, but rather ITS GIGANTIC DONUT ON THE ROOF OF THIS PLACE. SERIOUSLY, LOOK AT THAT THING! It's been in tons of TV shows, music videos, and movies. To name a few? Speaking of Zootopia, Disney made this absolutely awesome donut in commemoration of the movie and put it on the actual store! We mean, it's simply a HUMONGOUS DONUT. How many times can we say this?! If you think we're getting too excited, well, you're probably right. However, that doesn't mean that this gem of Inglewood is just cool for its novelty. 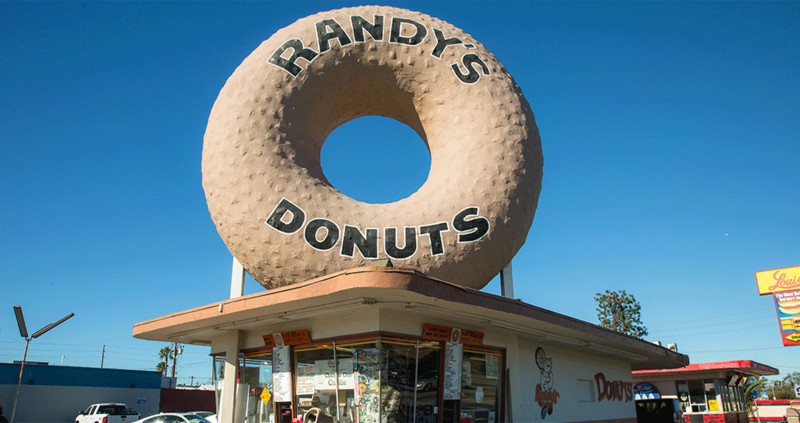 It's been recognized by the LA Conservancy for its historical status; they call Randy's Donuts, which was built in 1953 in the decade after World War II, a representation of "the postwar optimism and whimsy of the city in a way few other places can". If you're curious about what the donut is made of, then wonder no longer. It's set into place with steel bars and then covered with strong gunnite which ensures that this donut won't crumble anytime soon. If you're ever in the South Bay or Inglewood, then take a stop by Randy's Donut to make a memory that'll last a lifetime.